Law Web: Whether a matter can be referred to arbitration if there is mere reference of another Contract with an Arbitration clause? Whether a matter can be referred to arbitration if there is mere reference of another Contract with an Arbitration clause? Reliance may also be placed on M. Dayanand Reddy v. A.P. Industrial Infrastructure Corporation Ltd. (1993) 3 SCC 137 laying down that “the intention to refer to arbitration by such incorporation must be clear and specific. The question whether or not the arbitration clause contained in another document is incorporated in the contract, is always a question of construction this depends on the intention of the parties to be gathered from the relevant documents and surrounding circumstances….In the absence of clear intention of both the parties, agreement for arbitration cannot and should not be inferred”. Glencore International AG & Anr. 1. In a suit for Declaration, Permanent Injunction and Recovery of $ 12 lacs (Rs. 8 crores approximately) filed by the plaintiff against the defendants, application under Section 45 of the Arbitration & Conciliation Act (hereinafter referred to as ‘The Act’) has been filed on behalf of the defendant No. 1 to invoke arbitration agreement. It is contested by the plaintiff. 4. Pursuant to the written confirmation from the plaintiff, agreement dated 11.03.2016, being contract No. 061-16-12115-S (‘2016 contract’) incorporating all the terms of the ‘Business Confirmation E-mail’ and the plaintiff's e-mail dated 11.03.2016 was entered into (Annexure D). It is urged that the 2016 contract, similar to all previous contracts between the parties, provided for resolution of disputes through arbitration vide clause 32.2. Not only that, the said agreement was acted upon and various correspondences, raising of invoices, letter of credit etc. occurred subsequent to that between the parties. Subsequently, differences and disputes arose between the parties and the plaintiff acted in breach of terms of 2016 contract. The applicant was constrained to encash the standby letter of credit of USD 1,003,000. Since there was an ‘arbitration agreement’ between the parties within the meaning of Section 44 read with Section 2(f) of the Act read with Article II of the First Schedule of the Act, this Court has no jurisdiction to entertain the plaintiff's suit. The parties are governed by the 2016 contract. The plaintiff has not challenged the ‘arbitration agreement’ it being null and void or inoperative. Prayer has been made to refer the plaintiff to arbitration to be held in accordance with Rules of London Court of International Arbitration as provided in the ‘arbitration agreement’ contained in clause 32.2 of the 2016 contract. 5. In the reply to the IA, it is vehemently pleaded that there was no ‘arbitration agreement’ between the parties as required under Section 7 of the Act. Terms and conditions referred under the agreement dated 11.03.2016 were neither accepted nor concluded as the said agreement was never signed by the plaintiff/non-applicant. There was no question of acceptance of arbitration clause for adjudication of any dispute. E-mail dated 10.03.2016 is of no consequence as it was written by Glencore India Pvt. Ltd. and not by defendant No. 1. It is further urged that business modalities were initially reduced into writing in the e-mail dated 10.03.2016. The issue to refer the dispute to arbitration was neither discussed nor approved by the plaintiff any time. 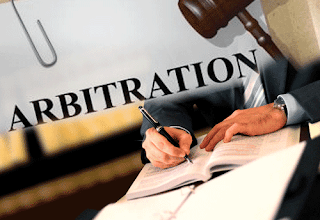 No valid ‘arbitration agreement’ came into existence between the parties. 6. I have heard the learned Senior Counsel for the parties and have examined the file. Relying upon various authorities ‘Smita Conductors Ltd. v. Euro Alloys Ltd.’,(2001) 7 SCC 728; ‘Shin-Etsu Chemical Co. Ltd. v. Aksh Optifibre Ltd.’, (2005) 7 SCC 234; ‘Alimenta S.A. v. National Agricultural Co-operative Marketing Federation of India Ltd.’, (1987) 1 SCC 615; ‘Virtual Studio Pvt. Ltd. v. TMT Investment Pte Ltd.’, 2014 SCC OnLine Del 7002; and, ‘Habas Sinai v. Tibbi Gazlar Isthisal’, 2010 Bus.L.R. 880, learned Senior Counsel for the applicant urged that a valid contract came into existence between the parties. The 2016 contract expressly contained the acceptance of the terms and conditions as per last contract i.e. contract of 2012. This contract of 2012 specifically provided for the ‘arbitration clause’ whereby the disputes arising between the parties were to be referred to the arbitration. At no stage, prior to the filing of present suit, the plaintiff objected to the arbitration clause. Rather various invoices were raised incorporating the contract number and these were never objected to by the plaintiff. 7. Learned Senior Counsel for the plaintiff urged that no concluded contract came into existence between the parties incorporating arbitration clause and the matter cannot be referred to the arbitration under Section 45 of the Act. Mere reference of contract number by the applicant in its communications cannot mean consent/agreement. Reliance was placed on ‘M.R. Engineers & Contractors Pvt. Ltd. v.Som Datt Builders Ltd.’, 2009 (9) SCALE; ‘U Can Fly Limited, Trading as Lycafly v. AVA SPA Holidays (I) Pvt. Ltd.’, 236 (2017) DLT 373; ‘World Sport Group (Mauritius) Limitedv. MSM Satellite (Singapore) PTE. Limited’, (2014) 11 SCC 639; ‘Chloro Controls (I) P. Ltd. v. Severn Trent Water Purification Inc.’ 2012 (9) SCALE; ‘Dr. Devendra M. Surti v.The State of Gujarat’, AIR 1969 SC 63; ‘Powertech World Wide Limited v. Delvin International General Trading LLC’, (2012) 1 SCC 361; ‘Registrar, Cooperative Societies, W.B. v. Krishna Kumar Singhania’, (1995) 6 SCC 482; and, ‘Trimax International FZE Ltd. Dubai v. Vedanta Aluminium Ltd., India’, (2010) 3 SCC 1. 8. Admitted position is that the parties had entered into various contracts in the years 2011 and 2012. There was a gap of four years thereafter before the parties revived their relations and opted to enter into an agreement in 2016 for the sale-purchase of 6000 metric tons of zinc from March 2016 to February 2017. 13. Nothing is on record if this change in the offer was expressly accepted by the defendant No. 1. It responded by another e-mail, “Thanks for Business Confirmation. Reverting with contract and proforma.” Nothing is on record to show if the contract containing detailed terms and conditions was exchanged thereafter and it was accepted by the plaintiff. The defendant No. 1 did not insist to get plaintiff's signatures on the contract accepting all the terms and conditions. Seemingly the defendant No. 1 started acting upon the said unsigned contract. 14. From the exchange of e-mails reproduced above, it cannot be inferred that the plaintiff had expressly or impliedly agreed to all the terms and conditions incorporated in 2012 contract. The e-mails sent by the applicant to the plaintiff did not specifically record the terms and conditions as contained in 2012 contract. In fact, there was no reference of 2012 contract in the various exchanges that took place between the parties. 16. On comparison of both the clauses, clause 29.2 in the 2012 contract and clause 32.2 in the 2016 contract, there is change in the terms and conditions of the arbitration agreement. Since there was changes in the 2012 contract as incorporated in the 2016 contract, this was never accepted by the plaintiff. It is well settled that the intention to refer to arbitration must be clear and specific. It is the duty of the Court to construe correspondence with a view to find out if there was any meeting of mind between the parties which could create a binding contract between them. Unless from the exchange of e-mails, it can unequivocally and clearly emerge that the parties were ad-idem to the terms, it cannot be said that an agreement containing arbitration clause had come into existence. The parties should have a clear intention, at the time of contract, to submit any disputes or differences as may arise to arbitration then alone the reference contemplated under Section 45 of the Act can be enforced. “29. Reliance in this regard can be placed on Alimenta S.A. v. National Agricultural Co-operative Marketing Federation of India Ltd. (1987) 1 SCC 615laying down “when the incorporation clause refers to certain particular terms and conditions, only those terms and conditions are incorporated and not the arbitration clause normal incidents of terms and conditions of supply are those which are connected with supply, such as, its mode and process, time factor, inspection and approval, if any, reliability for transit, incidental expenses etc.” It was held that the arbitration clause is not a term of supply and there is no necessity in law that when a contract is entered into for supply of goods, the arbitration clause must form part of such a contract. Accordingly, only those terms and conditions were held to have been incorporated into the second contract and not the arbitration cause. Similarly here, the “Acceptance Contract” which the defendant no. 1 made the plaintiff sign, cannot incorporate therein the arbitration clause on its website by referring to the website under the clause “Cancellation Rules”. Thereby, only the terms and conditions of the website as pertain to cancellation and which are specified on the website in a separate clause would get incorporated in the “Acceptance Contract”. 30. Reliance may also be placed on M. Dayanand Reddy v. A.P. Industrial Infrastructure Corporation Ltd. (1993) 3 SCC 137 laying down that “the intention to refer to arbitration by such incorporation must be clear and specific. The question whether or not the arbitration clause contained in another document is incorporated in the contract, is always a question of construction this depends on the intention of the parties to be gathered from the relevant documents and surrounding circumstances….In the absence of clear intention of both the parties, agreement for arbitration cannot and should not be inferred”. 31. Reference in this context may be made to Owners and Parties Interested in the Vessel M.V. “Baltic Confidence” v. State Trading Corporation of India Ltd.(2001) 7 SCC 473 also concerned with the incorporation of arbitration clause in a Standard Charter Party Agreement in a contract of carriage of goods and where the arbitration clause was held to have so stood incorporated. However the Bill of Lading in that case read as follows “All terms and conditions, liberties and exceptions of the Charter Party, dated as overleaf, including the Law and Arbitration Clause, are herewith incorporated.” The defendant no. 1 herein however deviated from inserting such a clause in its contract and having done so cannot be heard to contend that the arbitration clause on its website stands incorporated in the “Acceptance Contract”. 18. In the light of above discussion, the application under Section 45 of the Act to invoke the ‘arbitration clause’ is unmerited and is dismissed. 19. Written statement/reply shall be filed by the defendants within two weeks with advance copy to the otherside. 20. Replication/rejoinder, if any, shall be filed within a week thereafter. 21. List before the Joint Registrar on 29th November, 2017 for completion of pleadings, filing of documents and affidavits of admission/denial of the documents. 22. List before this Court on 19th December, 2017 for framing of issues and disposal of the captioned IA.